This super easy pasta salad recipe is the best in summer. Whether you take it on a picnic or in your lunchbox as a lunch alternative for work, this is a perfect and easy salad to make. It takes less than 30 minutes to prepare (Ready in 20 - 30 minutes) and serves 4. Yummy! Step 1: Cook the Pasta. Boil the pasta in salted water for 8 minutes then add the peas. Return the water to the boil and cook for two minutes more until the peas and pasta are tender. Tip into a colander over the sink. Cool the peas and pasta under the cold tap then drain really well. Step 2: Make the dressing. While the pasta is boiling, chop the tomato roughly and put in a food processor with the olive oil, vinegar, garlic, half the sun-dried tomatoes and about eight basil leaves. Season with freshly ground pepper and plenty of salt then whizz until smooth. Tip into a large salad bowl. Step 3: Toss and serve. Add the pasta and peas to the dressing. Slice the rest of the sun-dried tomatoes and add to the pasta with the remaining basil leaves. Tear in the salami or prosciutto and toss everything together. Pile into bowls and serve. 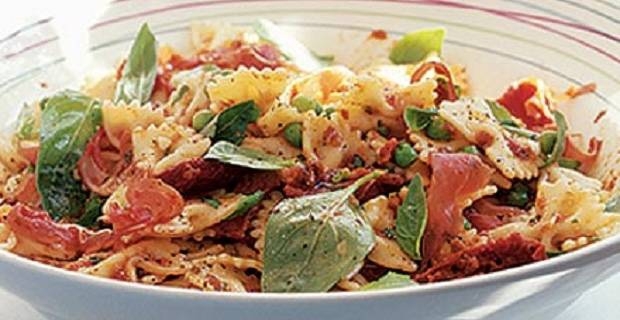 For a meat-free version of this delicious pasta salad recipe, use mozzarella instead of prosciutto. It makes a surprisingly dynamic vegetarian dish for a barbecue thanks to its rich flavours. The ingredients for both the regular and vegetarian options are lovely and light with pretty colours. Buy ingredients online at your selected retailer, and enjoy your salad outside if possible. Delicious...!